In 2017, Herrmann embarked on an extensive rebranding project with Jones Walker, a full-service New Orleans-based law firm with offices across the country. The 80-year-old firm’s brand did not reflect its dynamic energy and spirit, forward-thinking approach, nor its ability to handle sophisticated, cutting-edge matters. 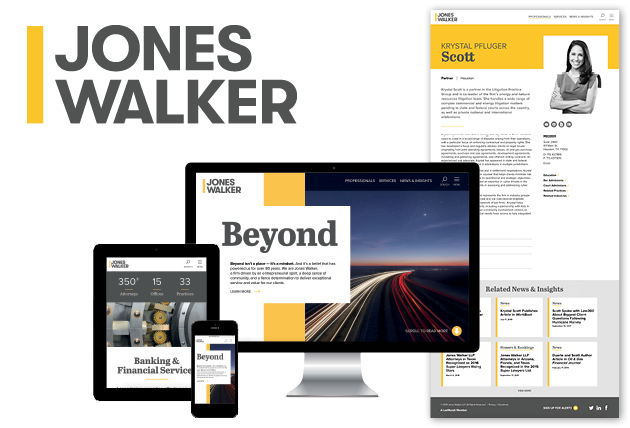 Following an extensive research exercise, we were able to ascertain key attributes that would form the basis of Jones Walker’s new brand image and messaging. These included the firm’s legacy of quality and service; its entrepreneurial, progressive and proactive mindset; its attractive value proposition; its collegial and outgoing personality; and the fact its footprint now extended well beyond Louisiana. Herrmann then developed the overarching brand platform and new logo. From font selection to color application to messaging, we wanted to reflect the firm’s duality: traditional values and legacy combined with the creativity, talent and sophistication to handle today’s legal challenges. A key message used to communicate this duality is “Beyond,” which is coupled with a series of words to reflect various aspects of the firm’s culture and commitment. The choice of the Jones Walker Yellow and Jones Walker Gray also emphasizes this duality. The bold Jones Walker Gray serves as a foundation for the inherent elements throughout the new brand while the vibrancy of the Jones Walker Yellow reflects the firm’s entrepreneurial spirit, creativity and proactive approach. Pairing the two colors creates a dynamic look that stands apart in the legal space. Herrmann incorporated these key brand elements when designing the firm’s new website, which uses a responsive format that allows viewers to easily navigate the site from various devices and “sticky navigation” that keeps key search functionality visible during page scrolling. The site features bold photography, distinctive imagery, informative content, timely thought-leadership commentary, videos and news. We partnered with one of the nation’s leading technology companies, RubensteinTech, to deliver a state-of-the-art platform that offers the latest content management capabilities and a host of user-friendly applications and tools. In addition to the website, Herrmann also created a full suite of marketing collateral that reflects the firm’s new image. These elements included pitch materials, PowerPoint templates, brochure templates, a pocket folder, stationery, office signage, an email signature and e-communications templates, and a comprehensive brand standards guide to ensure consistent application. With the recent launch of Jones Walker’s new brand and world-class website, there is no doubt that this is a law firm where entrepreneurial lawyers are excited, energized and engaged as they work with their clients and serve their communities.